Namely, on Monday, October 22, between 100 and 200 people walked from Cazin to Bihać and then to the border crossing Izačić. In the evening hours, the police cordon stopped the movement. All night between Monday and Tuesday they were on the open near the border crossing Izačići, along the border between Bosnia and Herzegovina and Croatia. The locals of Izačići welcomed them with food and jackets. Among the refugees, there was a great number of women and children who were accommodated in the temporary center at the „Sedra“ hotel near Cazin, that is intended to accommodate families with young children. The next day, refugees went to the border crossing Maljevac-Velika Kladuša requesting the opening of borders , but a police cordon was established. The refugees spent the night on the border, and they tried to cross over again on Wednesday. They then broke the cordon of the Bosnian-Herzegovinian police and came just a few meters from the borderline between Croatia and Bosnia and Herzegovina, where the Croatian police set up the cordon, and later the fence. That was the day when there was a close contact between police and refugees, which was debated by usage of different and contradictory information. According to some sources, while police in B&H were dealing with the situation, some people began throwing stones at Croatian policemen, and Croatian policemen used a tear gas. Several people were injured and one of the protesters tried to harm himself. The next day, around two hundred people were protesting at the border, including a significant number of families. Many of them, isolated and exposed to external pressures, were on a protest site, day and night without organized basic infrastructure support, access to electricity, food distribution, mobile toilets, etc. As pointed out in the No Name Kitchen report. Because of the closed border, tensions in the Great Kladuša itself appeared. So on Sunday, 28 October, the Association of Businessmen Velika Kladuša organized a peaceful protest where a couple of hundred locals gathered. They argued that the protest was not directed against refugees and did not want them to be instrumentalized by the media and others, and urged the authorities to solve the problem and to open the border to allow free movement of people and goods. This is not the first protest organized by the locals. 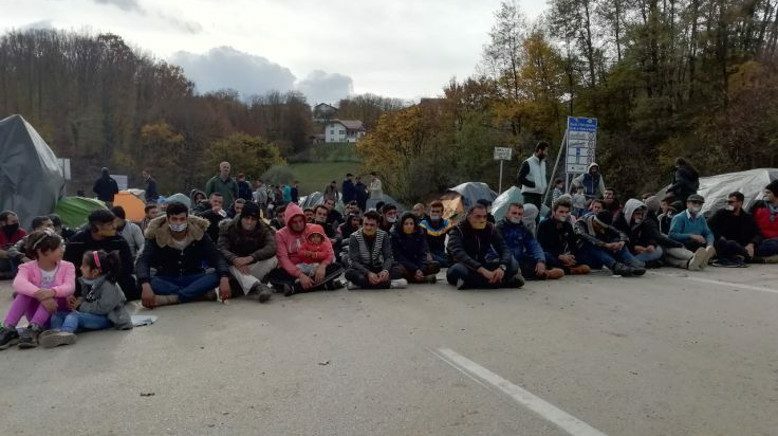 They also protested on Saturday, October 20th, when about two thousand people gathered in Bihać due to the increased arrival of refugees from the beginning of the year in the Una-Sana Canton; they demanded more decisive engagement of state authorities. According to data from the county-level of B&H, in that part of B&H between 100 and 150 people comes every day, and they are placed in inadequate conditions, with no perspective for improving or lifting their status. Police claims they record a steady rise in the number of people. Protesters added that the Ministry of Security of B&H requested measures that would aim to provide equal care for refugees in all parts of the country as this is not the only case for the Una-Sana Canton. In the speeches, it was felt that this was not a protest against refugees, but against authorities who did nothing to create conditions for them and to provide citizens with security. During the day, the protest was more peaceful, but in the evening the situation became more serious because then the residents of Bihać blocked the bus station and partly the main road and some even stopped cars and sought refugees. You can take a look at Al Jazeera about what was happening. The situation in B&H is a consequence of poor migration policies of the EU; due to it both refugees which are trapped in the status quo position, and the local population of a country that has a difficult economic situation suffer. The border crossing of Velika Kladuša – Maljevac was closed for traffic, because of, as the police claim, the protests of refugees near this border crossing. Although the refugees eventually moved away from the border and moved from the main access road, the Croatian police continued to block the border, and could technically open it for traffic. This did not only extend the agony of refugees who protested at the border but rather caused direct economic damage to the residents of Velika Kladuša. On Tuesday, October 30, a week later, after alleged negotiations, the police removed protesters from the border at the Miral facility in Velika Kladuša. So far, this facility has not been used for refugee accommodation, and last week the equipment and refugee accommodation facilities were completed in the barracks „Ušivak“ near Sarajevo, with accommodating capacity for 400 people. 360 refugees have already been displaced there. There is also a new center in the former factory „Bira“ near Bihać that has the accommodating capacity for 1200 people, and 450 people will be accommodated there. Also, the Center for Protection and Assistance to Asylum Seekers from Serbia states that last month there were more than a hundred refugees at the border crossing Batrovci (Serbia), and among them, there were families with children. 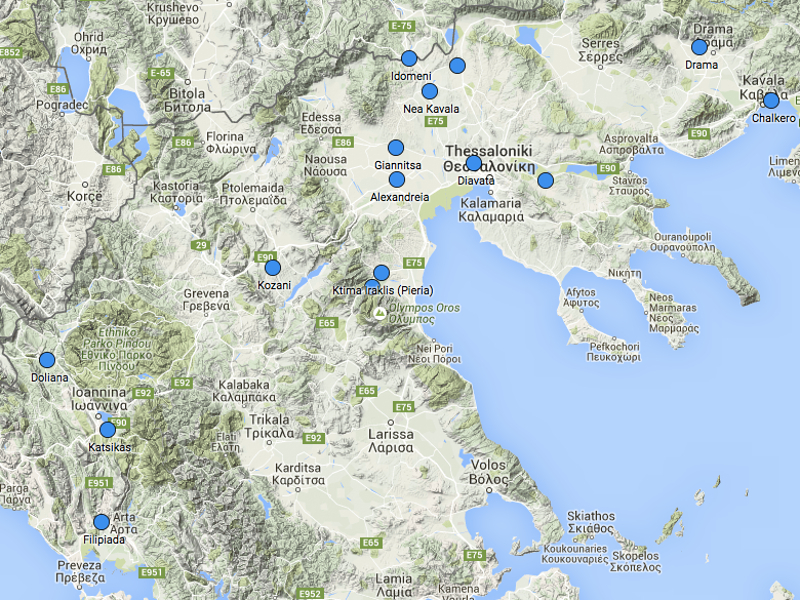 Most of them were from Adaševac camp, and a smaller number from Principovc. „Minister Božinović and I just talked about this. This is about the border crossing of Maljevac. The forces and border police have been strengthened and a special police force was sent. The Republic of Croatia, as it has been so far, protects Croatian borders from illegal entry and immigration, respecting all elements of border law, humanitarian law, and international law.“ For two years the Welcome Initiative! And other organizations and institutions have been warning about the violations of some of the elements of these rights, such as the right to access to international protection or the possibility to claim asylum or to violence at the borders of the Republic of Croatia, and there were no convictions from the Government of the Republic of Croatia and the Ministry of Interior, but only routinely disclaiming the responsibility. That is why we are asking, now that we have finally adopted the need to respect the borders, humanitarian and international law, when will it start to shift from words to actions? At last, It is important to address the way many Croatian media, with their superficial and sensationalist way of reporting, the lack of information and the consequent spread of disinformation, spread the hatred. The answer to one such article that tries to spread the fear of refugees has been written by the Jesuit Refugee Service. It is important to emphasize that while many media are trying to put the local community in opposition to the refugees, residentsof Velika Kladuša have been helping refugees for months, which is rarely addressed. The protest of refugees at the border was reported from a distance, without contact with people, which further dehumanized them and refugees were described as a homogenous, threatening mass of illegal migrants from which we have to be defended using all means. On Maljevac there was a protest, not an attack on the border. Such narratives created by certain authorities and politicians, and the media took over without further questioning, and that can be very dangerous. Finally, the refugees and residents of Velika Kladuša wanted the same – freedom of movement and the opening of the border – a right which the refugees have unfortunately still not achieved. Therefore, requests should be directed towards the authorities, especially those in Croatia and the EU, and not towards each other. The problem is not the refugees nor the local community – but the restrictive and repressive migration policy of the European Union which violates fundamental human rights. In this, we must play our role, especially in Croatia, whether we are organizations or individuals. What happens to refugees today, but also to volunteers/activists with the ever-increasing criminalization of assistance and police pressures, can happen to anyone if we agree to normalization this situation. Geflüchtete, die die Grenze nach Kroatien zu überqueren versuchen, sind der Gewalt der kroatischen Grenzpolizei sowie illegaler Pushbacks ausgesetzt. In Bosnien fehlen menschenwürdige Unterkünfte, viele Flüchtlinge müssen bei stetig fallenden Temperaturen draußen schlafen. Und der Winter kommt. Mit den fallenden Temperaturen werden die Bedingungen für Geflüchtete immer schwieriger. Es gibt nicht in ausreichender Zahl Unterkünfte und die Einrichtungen, die bestehen, sind oft nicht mehr als Notquartiere unter elenden Bedingungen. Cosa sta succedendo nel cantone di Una-Sana nel nord-ovest della Federazione della Bosnia ed Erzegovina? È difficile, in queste giornate di resistenza, mettere in ordine fatti e notizie. I media locali esplodono, quelli internazionali faticano a seguire le proteste e le manifestazioni di questi giorni. Vorrei quindi provare a spiegare anche agli attivisti, lettori e italofoni in genere, cosa sta succedendo in questo momento nel cantone di Una-Sana, uno dei dieci cantoni nel nord-ovest della Federazione della Bosnia ed Erzegovina, che dai primi mesi del 2018 è diventata tappa fondamentale per molti migranti in viaggio verso l’Europa 1. Lunedì 22 Ottobre. Pomeriggio. Centinaia di persone si mettono in marcia verso la frontiera con la Croazia, al posto di blocco di Maljevac e a quello di Izačić, dove attivisti e volontari, locali e internazionali, portano cibo, coperte e tè caldo. Vengono dal campo di Cazin (Hotel Sedra), da quello (improvvisato) di Velika Kladuša, da Bihać. La polizia bosniaca dichiara pubblicamente che “li fermerà, ma che non possono impedire il loro arrivo [al confine]” (2. La retorica giornalistica è sempre la stessa: si parla di migranti “illegali”, di migranti “senza documenti”. Imponente l’immediato dispiegamento delle forze di polizia, sia bosniaca che croata: agenti in tenuta antisommossa, elicotteri, camionette. Ci sono all’incirca 300 persone, i volontari e gli attivisti non vengono fatti avvicinare alla zona della protesta. Moltissime famiglie con bambini, soprattutto al posto di blocco di Izačić, che con i loro corpi bloccano la strada e chiedono l’apertura dei confini. Parlo con un attivista dell’organizzazione No Name Kitchen, presente sui punti critici della “Balkan Route” da ormai quasi due anni. Mi spiega che c’è una frustrazione generale su più fronti: l’impossibilità di raggiungere l’Europa a causa delle politiche dell’UE è sicuramente una costante nella vita delle persone in transito. Queste politiche vengono poi messe in pratica dalle polizie dei paesi lungo la rotta balcanica con violenze, respingimenti illegali, furti di telefoni e denaro, umiliazioni. No Name Kitchen, assieme ad altre organizzazioni e collettivi come il Centro Studi per la Pace, l’iniziativa Welcome, Are You Syrious, Rigardu, raccolgono ormai da due anni centinaia e centinaia di testimonianze e casi di pushbacks esercitati dalla polizia croata ai confini con la Serbia e con la Bosnia Erzegovina. Gli innumerevoli tentativi falliti di proseguire nel proprio viaggio, si sommano poi ad delle condizioni di vita quotidiana estenuante. Campi improvvisati nel bel mezzo del nulla, tende e giacigli di plastica che alla prima pioggia si piegano su se stessi, condizioni igieniche allarmanti, nessun tipo di assistenza medico-sanitaria se non fosse per il team mobile di Medici Senza Frontiere che un paio di mattine a settimana cerca di assistere chi può. I volontari e gli attivisti di NNK sono riusciti ad installare delle docce, ma ogni giorno è sempre più difficile e ogni persona è sempre più stanca, stufa, amareggiata, arrabbiata. Sono state poi diffuse delle voci sul fatto che i confini stessero effettivamente aprendo 3. La rabbia e il disappunto nel trovarsi davanti a una situazione opposta, ha creato una unica e sola reazione: “we do not want to go back”. Non torneremo indietro. Nel frattempo, è da sabato che nella città di Bihać vanno avanti proteste da parte dei cittadini locali per la situazione insostenibile nel centro 4. Sin dall’inizio, il presidio era stato chiaro sulle motivazioni della protesta: non è un presidio contro i migranti, ma contro la Federazione e la non-gestione della loro sistemazione. Per quanto la popolazione bosniaca si sia mostrata generalmente empatica e pronta a supportare chi si trova in difficoltà, i cittadini di Bihać dichiarano di essere stanchi di doversi occupare da soli del problema, senza alcun tipo di supporto da parte delle istituzioni. La situazione è rimasta calma finché un gruppo di partecipanti al presidio ha deciso di dirigersi verso la stazione degli autobus per bloccare i mezzi in arrivo da Sarajevo, presumibilmente pieni di migranti, dichiarando come “la Federazione li abbia lasciati soli nella gestione del flusso di persone arrivate, e abbia addirittura stabilito ad hoc una linea ferroviaria da Sarajevo a Bihać”. L’organizzatore della protesta è un consigliere comunale, Sej Ramić. Anche lui è andato alla stazione degli autobus per partecipare al blocco degli autobus pieni di persone in transito verso il nord della Bosnia. Quindi, se da un lato è vero che la protesta è contro le istituzioni, c’è anche una parte della popolazione che invece fomenta la caccia all’uomo alla stazione degli autobus. “La polizia sta cominciando a mettere in atto una serie di provvedimenti per limitare la libertà di movimento dei migranti in città e l’arrivo dei nuovi migranti da Sarajevo. Quindi sta notte [la notte tra il 23 e il 24 ottobre] stato bloccato un treno con a bordo delle persone che poi è stato rimandato indietro”, spiega Silvia Maraone di IPSIA in un’intervista a Radio Onda d’Urto. Attivisti sul campo ci aggiornano su come un altro treno nella notte, con a bordo tra 50 e 70 migranti, ha fatto fare dietro-front e ha rispedito le persone a Sarajevo. Martedì 23 Ottobre. Mattina. Anche al confine tra la Serbia e la Croazia 5, al posto di blocco di Batrovci, centinaia di persone bloccano il passaggio e chiedono con fermezza di aprire i confini. Mercoledì 24 Ottobre. Le proteste al confine continuano, circa 300 persone sono ancora al confine. Cominciano gli scontri tra la polizia e i manifestanti, che riescono a forzare il primo cordone di polizia bosniaca. La polizia croata in antisommossa reagisce, lancia lacrimogeni, ci sono 3 feriti (tra cui un bambino di 5 anni) che vengono portati in ospedale. Anche Medici Senza Frontiere si reca al confine. Il team di pronto soccorso bosniaco assiste altre 22 persone vittime degli scontri. Le organizzazioni internazionali interrompono le distribuzioni di cibo nel campo improvvisato di Velika Kladuša, e si rifiutano di distribuire cibo e acqua in qualsiasi altro luogo “non ufficiale”, negando di fatto qualsiasi tipo di supporto o assistenza ai manifestanti. Giovedì 25 Ottobre. Mattina. La situazione è estenuante, al confine ci sono ancora circa 150 persone in presidio con tende da campeggio. Si rifiutano di abbandonare l’area. Media locali e commenti su facebook si indignano per le condizioni in cui le persone hanno passato le ultime notti a dormire all’addiaccio sulla strada, ignorando il fatto che queste persone siano in queste condizioni di non-accoglienza ormai da mesi, “dormire qui in mezzo alla strada o nel campo improvvisato di Velika Kladusa, nel fango, non fa differenza”. Dal lato bosniaco della frontiera, si vocifera di un possibile intervento dell’esercito croato, smentito in serata. Intanto però, la polizia innalza grate di ferro tra il cordone in antisommossa e i migranti. Sui media locali, la protesta al confine viene descritta come una minaccia all’ordine e alla sicurezza nazionale, un assedio. Giovedì 25 Ottobre. Pomeriggio. Come riportato da DIP, ai manifestanti vengono dati diversi ultimatum sullo sgombero dell’area. Nessuno di questi viene rispettato. Gli attivisti di NNK riportano diverse voci dal confine 6. Venerdì 26 Ottobre. Mattina. Dopo un’altra notte passata in presidio al confine, i migranti in protesta non desistono. Le autorità croate dichiarano che non riapriranno il posto di blocco di Maljevac (per mezzi e persone con documenti validi per l’espatrio) finché il presidio di migranti non verrà sgomberato. Intanto, 117 persone vengono trasferite da Bihać al nuovo centro di accoglienza poco fuori dal centro città, presso gli edifici di una ex fabbrica di frigoriferi, “Bira”, la cui capacità è al momento di 400 persone (IOM sta provvedendo a portare altri container per ampliare la capacità fino a 1200). L’edificio sarebbe il primo vero centro di accoglienza che, dall’inizio dello spostamento della rotta verso la Bosnia a Gennaio 2018, viene aperto nel nord del paese. Da mesi se ne parlava, non riuscendo a trovare un accordo tra il governo bosniaco e le amministrazioni comunali, e la presenza delle richieste dell’UE di non posizionare campi troppo vicino ai confini. Sabato 27 Ottobre. Il confine di Maljevac continua ad essere bloccato al traffico, e le tende montate sulla strada sono ormai più di 60. Ai volontari viene vietata la distribuzione di cibo, acqua e vestiti. Team medico assente. Oggi non sono arrivati autobus a Velika Kladuša: le persone sono bloccate e alcuni pagano fino a 350 euro per arrivare alla zona di protesta. Un ragazzo iraniano al confine mi dice “I can’t go back home in Iran, I can’t go back to Bihać, I can’t cross the border, the don’t want me to stay here. Where am I supposed to be?“. Famiglie, donne e bambini continuano a prendere parte al presidio. Gli sguardi che incontro sono tanto stanchi quanto determinati. Verso sera, i manifestanti cominciano a raccogliere legna nella boscaglia e ad accendere i fuochi per scaldarsi. Locali portano cibo o acqua, e vestiti per i bambini. Nel frattempo però, in città viene annunciata per domani (domenica 28 ottobre) una protesta contro la chiusura del passaggio del confine.